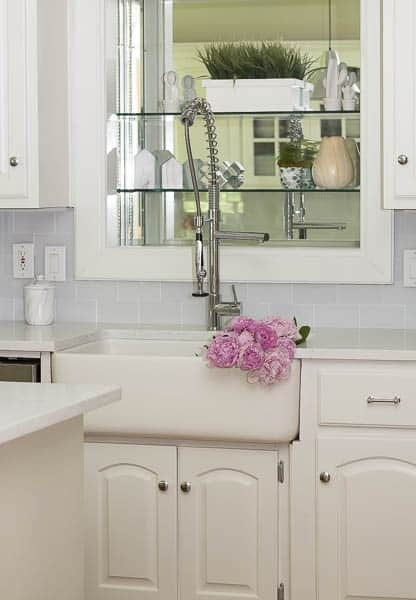 Spring is here and I have my Spring Ideas Home Tour ready! 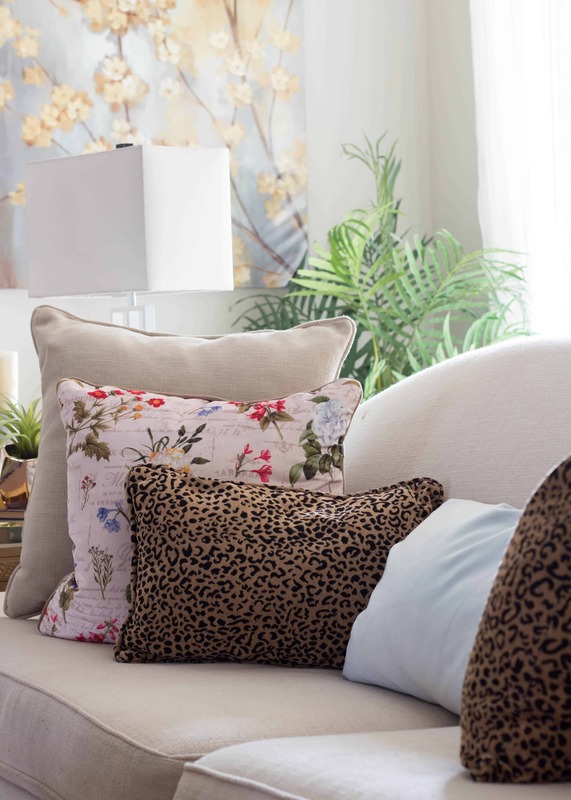 I have added touches of spring throughout my home such as pillows, flowers, and dishes using beautiful spring pastel colors. The color that I have used most this year is blush pink. 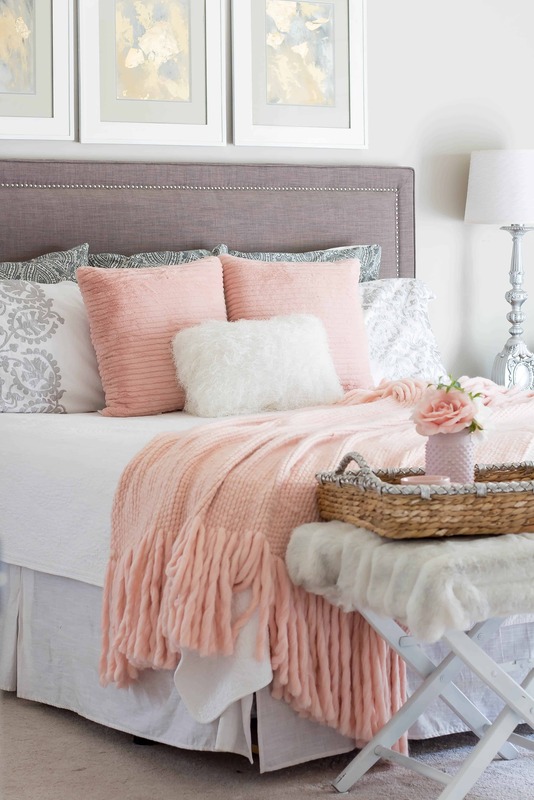 I love all things blush pink. 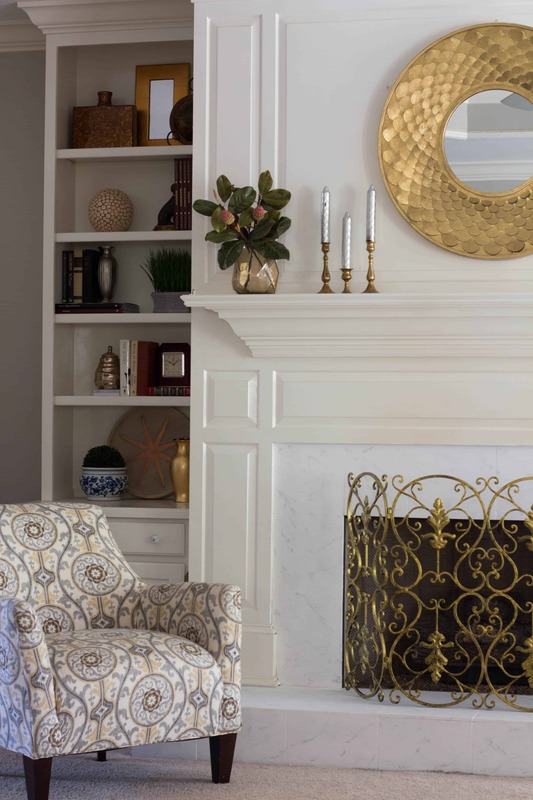 If you are visiting from Red Cottage Chronicles, thank you for coming to see my home tour.I want to thank Jenna Shaughnessy from Wife in Progress for organizing the Styling for Spring Home Tour. She is very talented and you will love her blog. 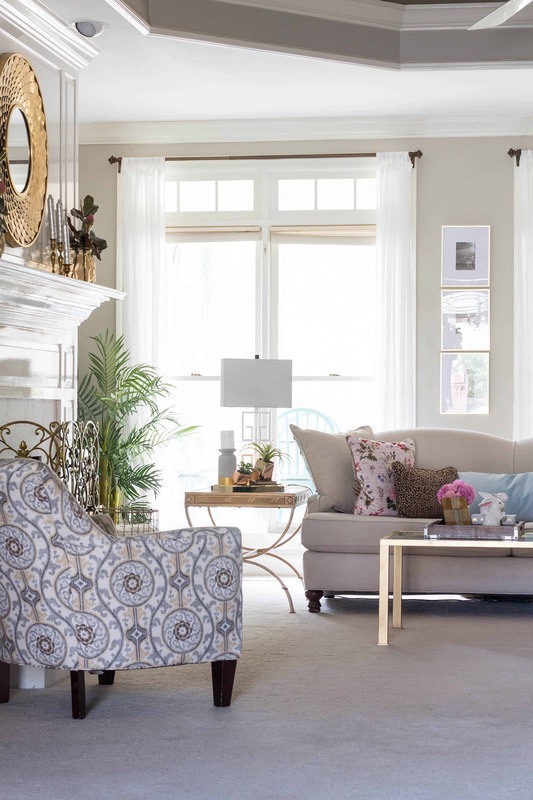 Jenna has gathered over 30 talented bloggers together to showcase their spring decor. We are hoping that you find inspiration in all of these homes. At the bottom of the post, visit the next blogger on the tour, Saw Nail and Paint. You can visit all of the other bloggers from there or from the links at the bottom. I really try to be smart with our finances when I decorate our home so I use what I have first. Then I add a few new and a few thrifted pieces of decor. I think women love to be surrounded by pretty things and that is normal. My place for new seasonal items is HomeGoods and Amazon. Let’s start in the kitchen! My husband and I built this zinc top table and it is the only piece of furniture we have ever built. 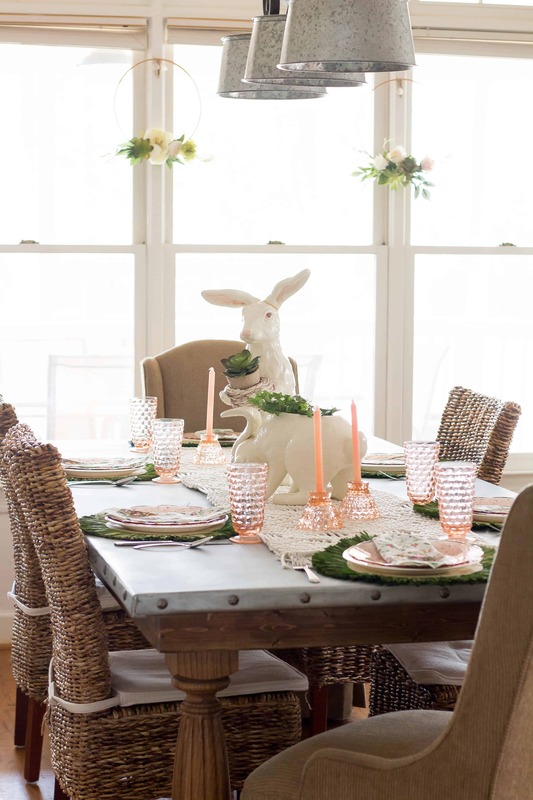 I think this table helps make a beautiful tablescape.I found the blush colored dishes while thrifting a few weeks ago and I think they look perfect on the bright green straw placemats. I broke one of the ears of my bunnies this year but doesn’t all ceramic bunnies usually end up with a glued ear anyway? These soft colored floral embroidery hoop wreaths were so easy to make and hung in a window brings spring into the room. I used flowers from an old flower arrangement because I love repurposing! 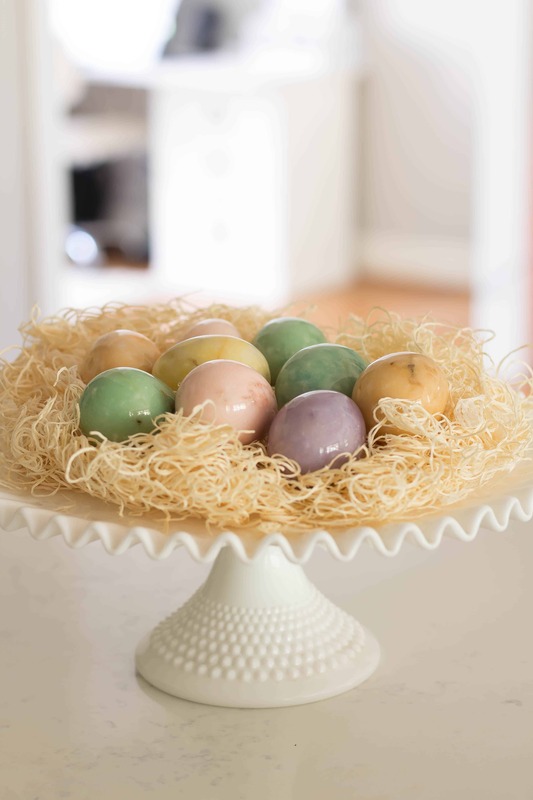 A few glass eggs on a milk glass cake stand always makes a beautiful display. I removed all my plaid and fur pillows and replaced them with a few new and a few thrifted pillows. Pillows are my favorite way to bring in spring colors. I try to purchase pillow covers and change them out so that I don’t have to store all of the extra pillows. Succulents are so pretty for spring and there are so many ways to display them, you can get creative by changing up the pots or vases. I just repainted the tiles on my fireplace and did a faux marble technique and the post will be on the blog next week. I painted the old fireplace screen which was black and looked worn. I used a gold leaf paint and I love how expensive the old screen looks now. The tutorial will also be on the blog next week. My bedroom is my favorite! 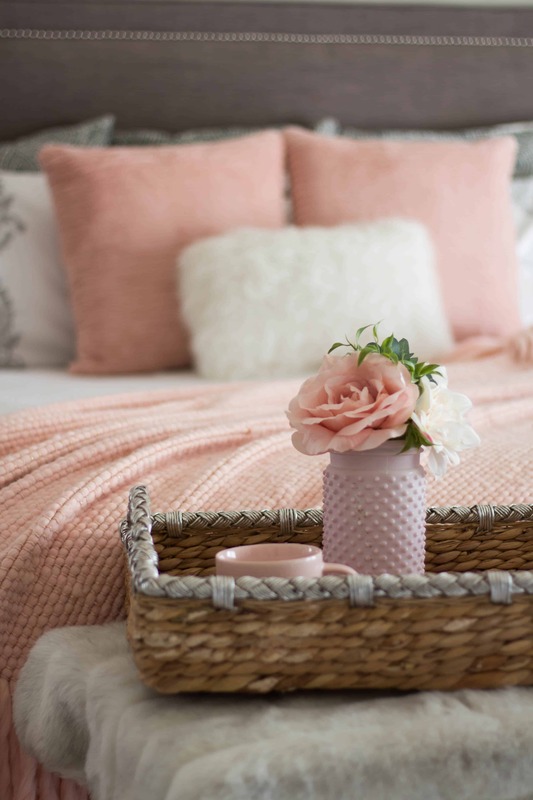 I have to have a heavy throw on my bed all year because my family likes our home so cold at night so I purchased a new throw and pillows in a pretty blush color. I seriously go weak for all things blush colored! 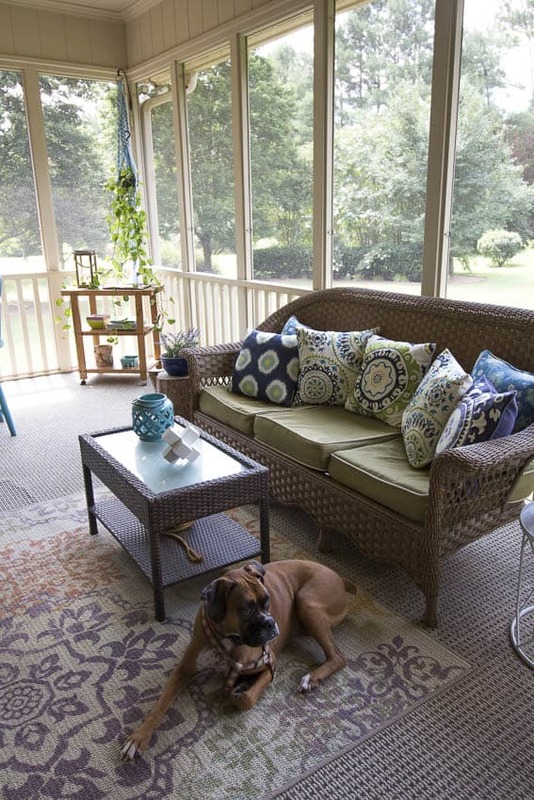 I am in the process of pulling out all my summer pillows and getting the porch ready for warm weather. This has been the coldest winter in Alabama that I can remember. 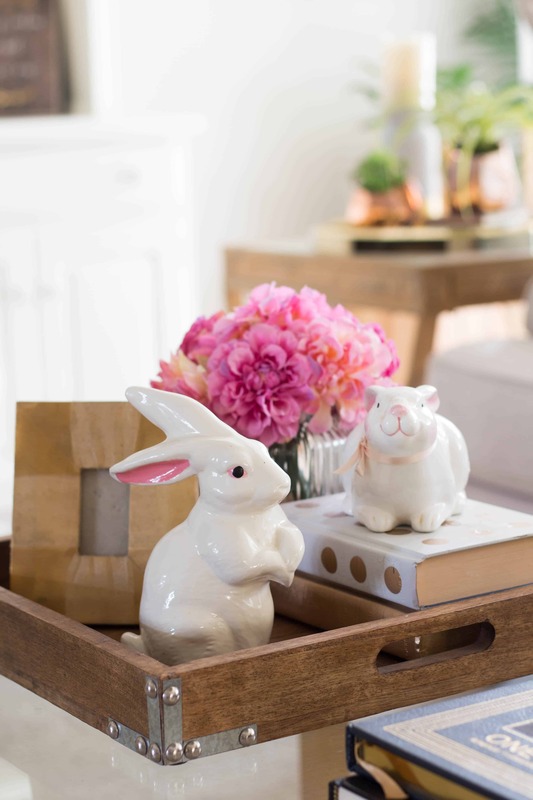 I hope you enjoy my Spring Ideas Home tour and I hope that you found some ideas for spring to use in your home. 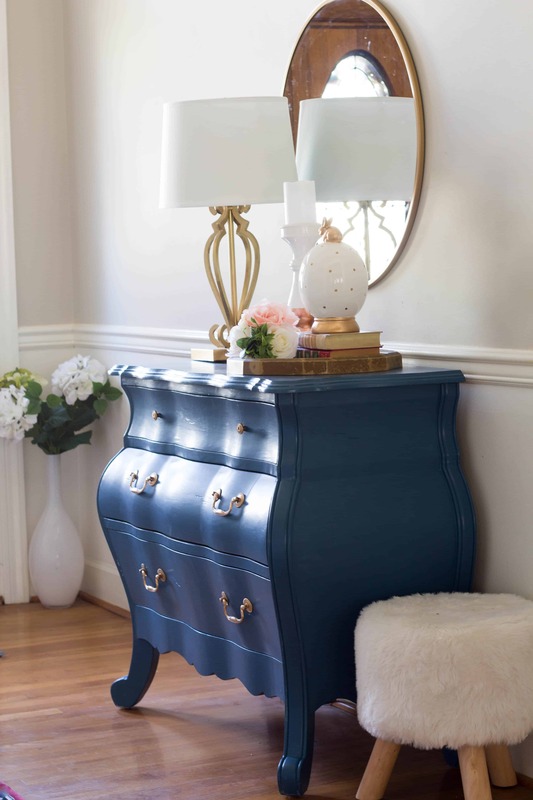 Be sure to head to The Tattered Pew to see the next gorgeous spring home and don’t forget to visit all of the other talented blogger’s homes because I think that you will find a lot of inspiration. You may also like these projects. Your home is just beautiful! 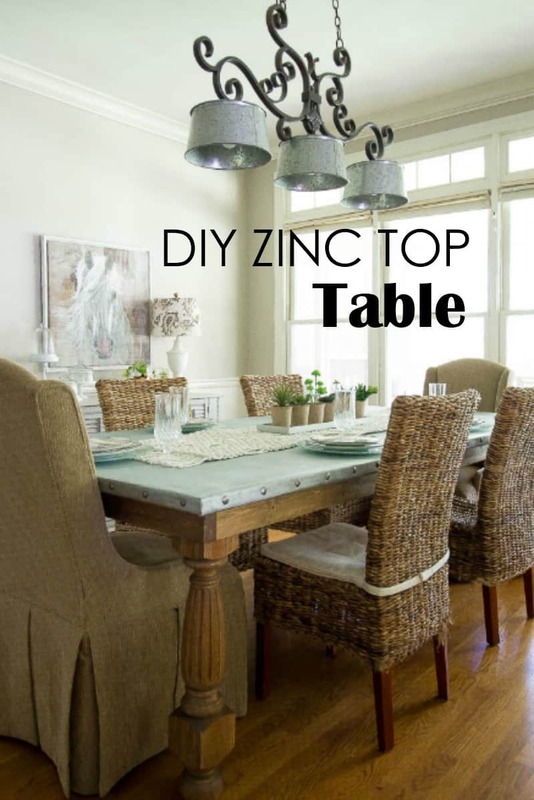 I especially love your zinc table! I can’t believe you made it! So fun joining you on this tour! Your headboard is so pretty!! 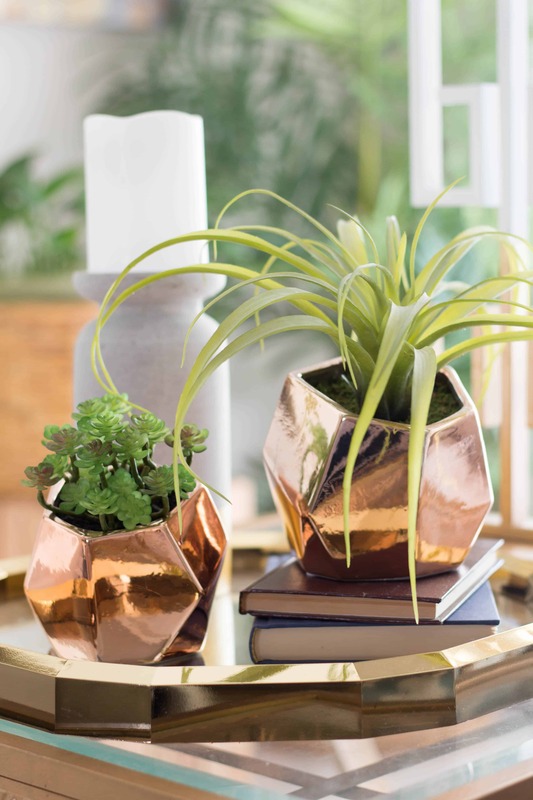 And I love those copper succulent vases! Such a beautiful home! I have to agree your bedroom is a favorite! I could almost feel myself relax looking at those soft colors. Especially drawn to your screen porch though. We have a large screen porch as well, but the bottom is more solid. I have pinned it to show my husband how nice it is opened up on the bottom! 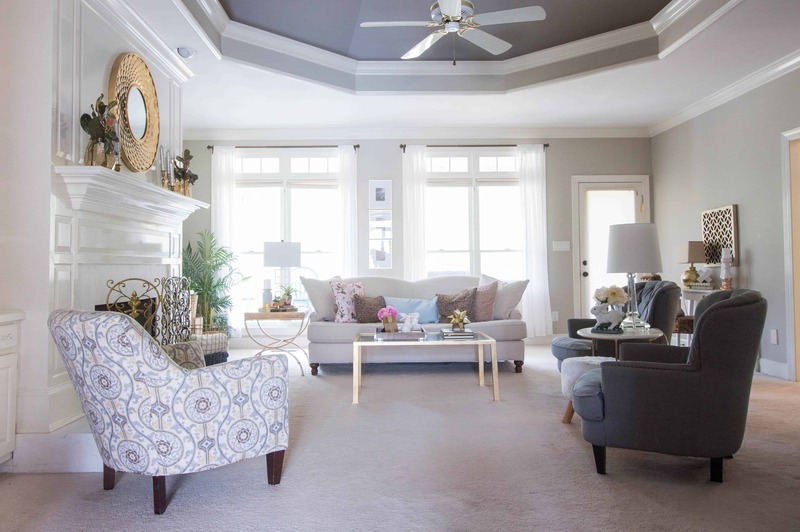 Your Spring touches are so perfect, Sherry! I especially love the blush in the master bedroom. You’ve inspired me to try thifting again. It’s been a while because I get discouraged when I don’t find anything good. Keep your fingers crossed that I find some treasures like you have! 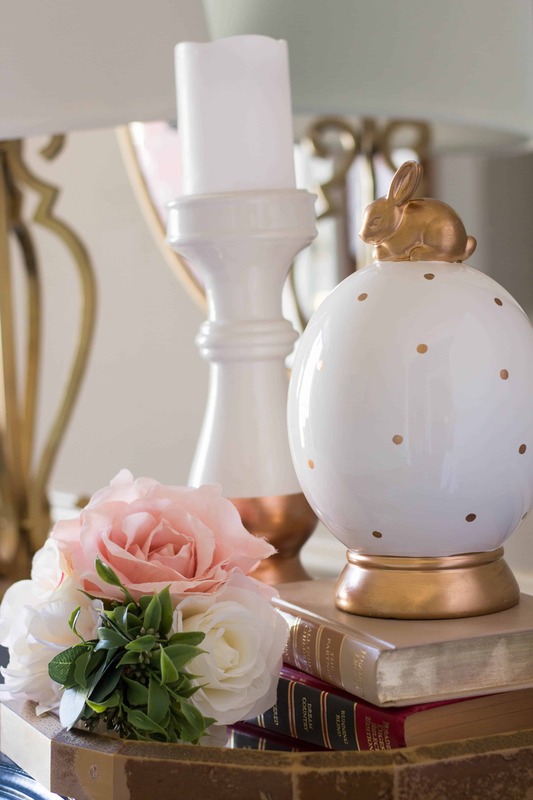 I decided to try out blush pink in our spring decor this year too, and I am loving it!! All of these details! A perfect complement from room to room. I love all the sweet pink elements scattered everywhere. 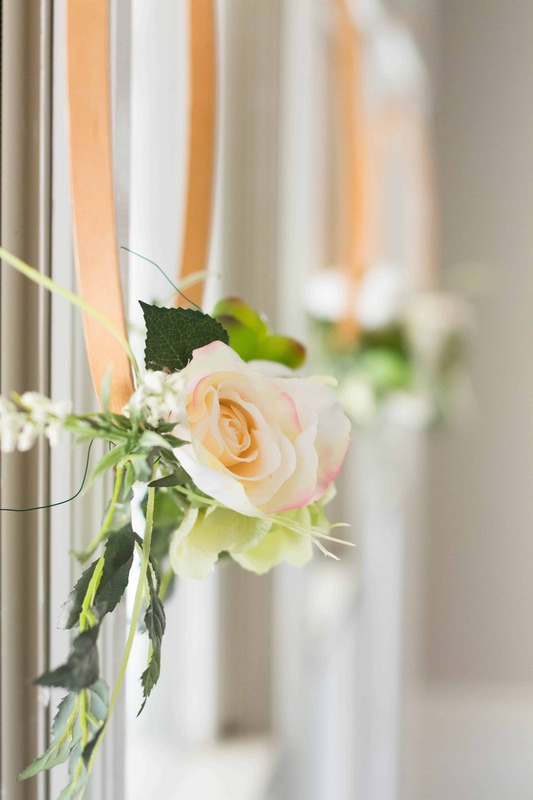 And those hoop wreaths are so beautiful – not to mention your photography! I am loving all the details from room to room! It’s a marriage of perfection! And those hoop wreaths are fantastic – not to mention your photography! Love all the inspiration! I loved your home. 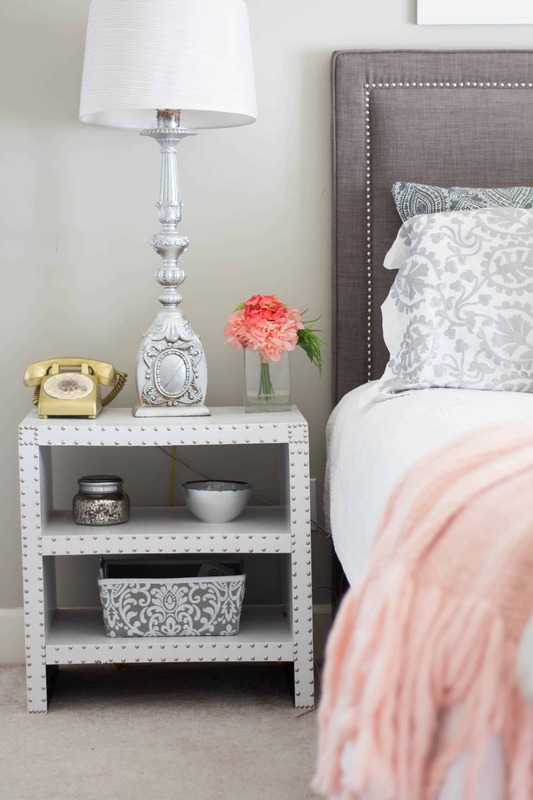 Especially the metallic details in the bedroom and the living room! Your home is such a gorgeous space and I can’t say enough about your bedroom. WOW! It’s such a lovely space. Happy Spring! Wow! 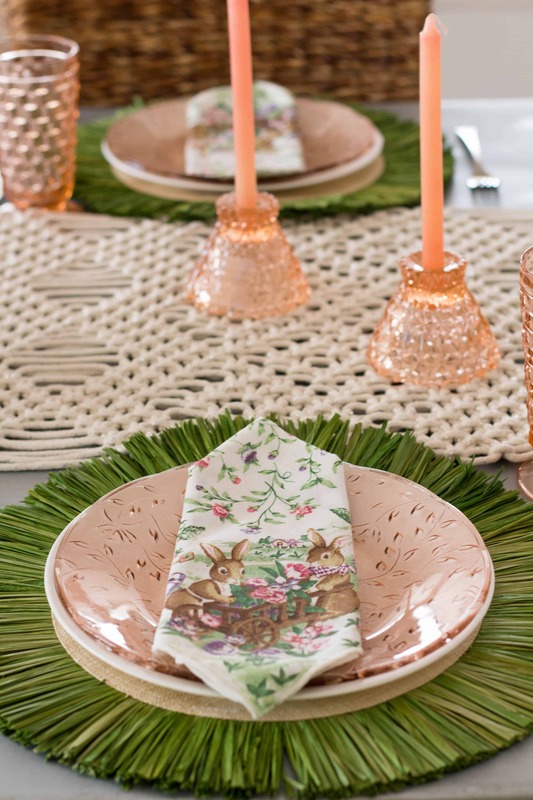 Your home is stunning – I just love the blush colored dishes and glasses and I’m in awe of your table! It’s all so gorgeous and perfectly springy!